HDCVI Camera is a High-Tech Genius! Don’t be caught without an HDCVI camera. Crime in the modern day is extremely apparent- search any online news articles on break-ins and you’ll swiftly be drowned in article after article of instances under which criminal activity occurred right under the nose of a security camera. This is completely devastating as I’m sure you, a business or home owner in need of extra eyes around the property. You are completely aware of how long it takes to select a camera, the hours and strife you as a business owner or other take to finally decide on the proper equipment to protect what you initially worked so hard for in the first place. Don’t allow other companies to take advantage of you in such a way that your priorities are at stake. Security Camera King is here to offer you the best out of any line of product to be sure everything you own is secure, and if any criminal activity does occur on your property, our products will be there to record it, as though you have a digital security guard watching your back every hour of the day. In this article, some of the best on the market will be addressed, and those are called the HDCVI Camera. HDCVI stands for high definition composite video interface. The word “high definition” should immediately bring to mind an extraordinarily crystal-clear picture! If you need to capture the face or even license plate of an individual who unfortunately burglarized your home or business, it will be a lot easier to see than with, say, an older or less modernized system, based on its ability for that clear picture. 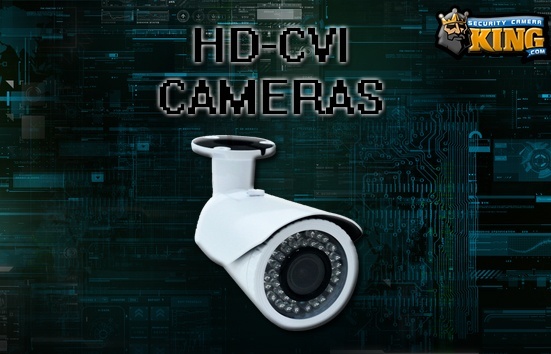 The HDCVI camera has some pretty interesting capabilities that you will certainly be interested in when choosing to keep your property safe. For example take the topic of cable runs. With your HDCVI camera, you will be able to secure a whopping sixteen-hundred feet of video transmission/ it is important to note with this sixteen hundred feet of video transmission, if your goal is to give your HDCVI camera more juice with a higher voltage of power, be extremely careful as it would be a shame to take all of that hard work and effort of finally choosing and mounting an HDCVI camera to just fry it in the end. Make sure you get proper advice on how to mount your HDCVI camera properly and what technology/cables to use with them as well. Here at Security Camera King, we have an excellent tech support that will easily be able to assist you with any of these camera types, and of course not just limited to the HDCVI camera. To add more information on the topic of the HDCVI camera and all it has to offer, it includes the ability of point to point transmission. Try to think of it this way: in the office if you are the employee given the task of taking calls, you may be aware that point to point simply indicates a call system in which a caller is on the line with another caller, a regular, run of the mill, everyday phone call. Simple and easy to understand, correct? Now, when it comes to an HDCVI camera, the same applies, only in tech circumstances. This just means that there are two points of communication when transmitting information, leaving out a massive amount of room for the device to, basically, get confused over vary amounts of information coming at it, having that information lost, of the device misplacing the information it is being sent along the way. A simple line of information, from point A all the way to point B with nothing in between. On top of making it less likely for ultimate video loss, the point to point on a HDCVI camera makes sure the video is unable to lag, and also makes sure the video is able to stay on top of its game! It’s good to keep note of the fact that your HDCVI camera will definitely need to have its very own supply of power. In order to do this, you will need a DC cable, and perhaps require a DC Power Terminal. A power supply (what your HDCVI camera will require) is just a type of technology which provides electric energy to the actual device. As a whole many electrical devices do have a power supply, which are even commonly called electrical power converters. On the other hand, what you should also know is the function and purpose of a DC connector. A Dc connector for you HDCVI camera is simply an electrical connector that also supplies electrical current. Most importantly of all, however, is that you use your HDCVI camera with a DVR that is capable to use with it, otherwise you may miss out on some incredibly important footage if not installed from the beginning. If you need any assistance in figuring out what DVR system is compatible with your HDCVI camera, do not ever hesitate to call our wonderful, knowledgeable and experienced sales team to help you take the next step and make that decision on which DVR system to choose, as we offer some of the highest makes and quality on the market. Security Camera King will absolutely never let you down in that respect. Also, if you ever require tech support on one of the devices you ordered, the HDCVI camera included in that list, when available they will be right here to take your calls and answer those seemingly unanswerable questions that heavily plague your mind! You have a question, tech support can solve it. Always come to Security Camera King for your security camera needs!